Goodness gracious, is this stuff good. 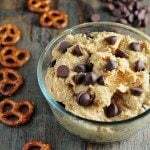 My whole addiction with taking sweet dips to functions started with my Cookie Dough Dip that everyone just loves. But you know, after you take that same dip to so many functions, you feel like you aren’t bringing your “A” game anymore. You need to up the ante just a bit, if you will. I’m sure you know what I mean. So, anyway, I upped the ante. With this. I call it Candy Bar Dip for lack of a better name. It doesn’t actually have any candy bars in it, but I was going for the taste of one of my favorite candy bars, the one with chocolate, almonds and coconut. If you like those, then you’ll love this dip. 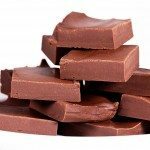 Candy Bar Dip. 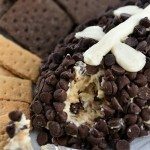 Be sure to make this candy bar dip for your next function. It is sure to be a hit. 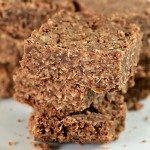 Full of almonds, coconut, and chocolate! Cream together cream cheese and butter. Add in vanilla and sugars and beat until creamy. 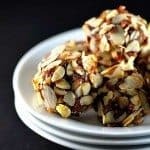 Stir in chocolate chips, coconut and almonds. 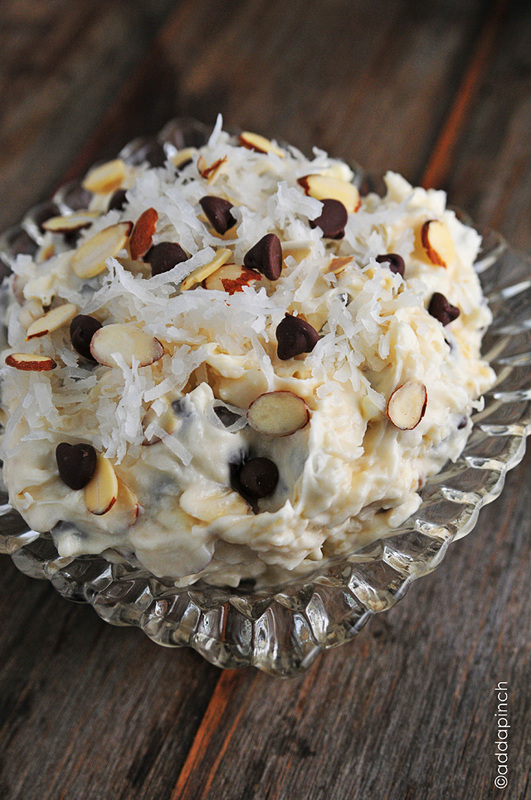 Spoon into a serving bowl and top with additional chocolate chips, coconut and almonds for serving. Serves well with pretzels, fruit slices, and graham crackers. Oh ma gawsh. That sounds amazing. What a dip! This is delicious. Oh my, this is what I want for breakfast…today. What a lovely sweet treat this is! 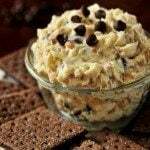 I LOVE the Cookie Dough Dip. Can’t wait to give this one a try, too! Oh Laura! 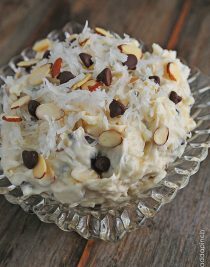 If you love coconut and almonds, you’ll go nuts over this dip! YUM!!!!! Oh my. I see myself dunking a whole lotta veggies in this and not feel guilty at all. I am going to try this with my Fire Cracker Crackers, yumm!!! Veganized and scaled back this recipe over the weekend and it was PHENOMENAL! I love trying new recipes and can’t wait to try some of these!! Yum!!! !